Res judicatae is a legal term for matters that have already been adjudged. 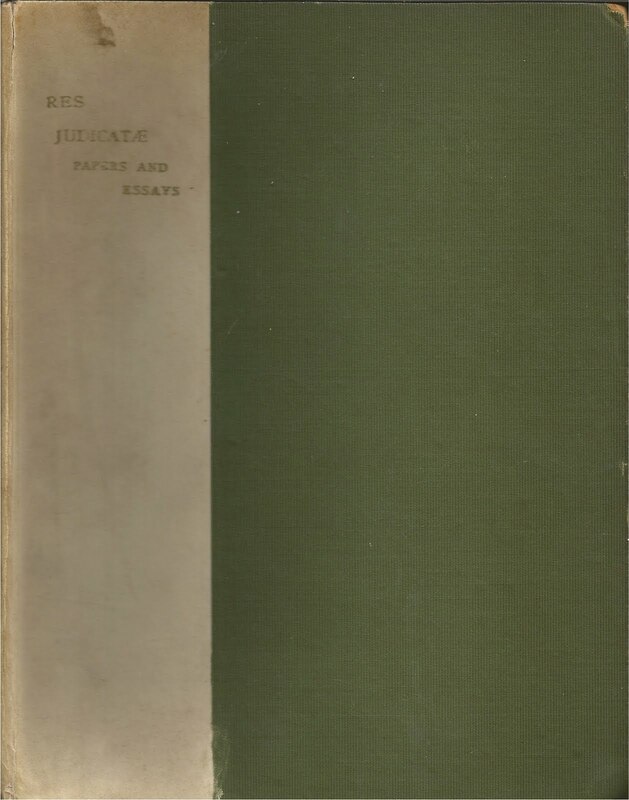 The term was used as part of the title of a book by Augustine Birrell: Res Judicatae: Papers and Essays, London, 1892. Augustine Birrell (1850-1933) was an English politician, an author, and a lawyer. Birrell's first book, Obiter Dicta, was not about legal matters. And except for one essay, "Authors in Court," neither is Res Judicatae. This book contains biographical essays and other papers by Birrell which were previously published in Macmillan's Magazine, the Reflector, Scribner's Magazine or the newspaper, the Speaker. Birrell's book is the newest addition to My Sentimental Library Collection. Tracing the provenance of this copy, researching the players involved, and telling you all about it, has brought me hours of enjoyment. And hopefully, reading this post will bring you more than a few minutes of enjoyment. 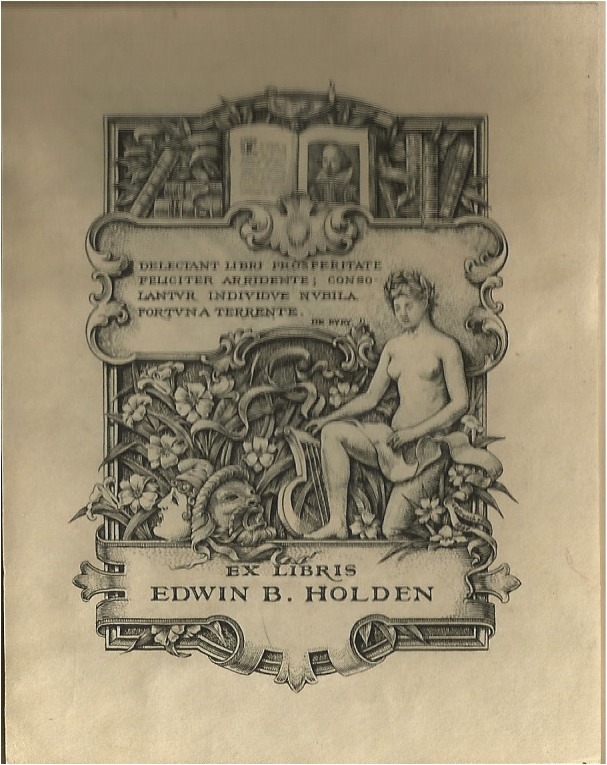 Edwin B. Holden was the seventh President of the Grolier Club, and the first to die in office. A lover of fine bindings and prints, Holden was a founding member of the Club Bindery and the Society of Iconophiles. The Club Bindery was created in New York City in 1895 to offer American book collectors European-quality hand bookbinding. An inexpensive and interesting book to read about the Club Bindery is Fine Binding in America: the Story of the Club Bindery, by Elbert A. and Lawrence S. Thompson, Urbana, 1956. The Society of Iconophiles was created in 1895 to commission the best artists to engrave prints of New York City. 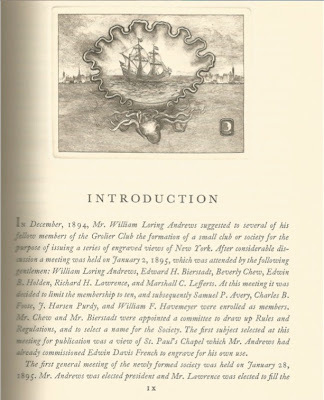 Membership was limited to ten active members; but, in 1905, fifty associate members were elected to the society, who were permitted to buy the Society's engravings. 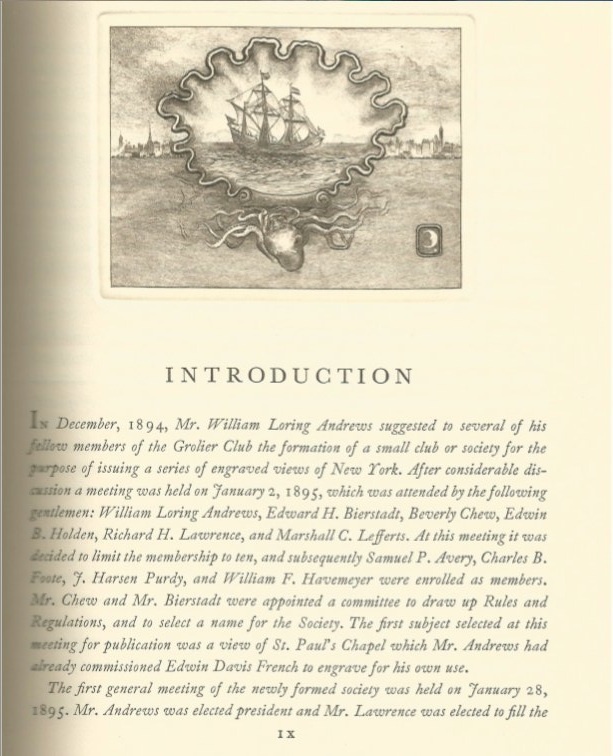 An interesting but rather expensive book on the Society of Iconophiles –– copies are listed from $200 to $450 –– is the History of the Society of Iconophiles of the City of New York : MDCCCXCV : MCMXXX And Catalogue of Its Publications With Historical and Biographical Notes, Etc. New York, 1930. Only 186 copies of this book were printed. Holden's personal library consisted of first editions of British and American literature, French illustrated books, fine bindings, and early American printing. He had the second and fourth Shakespeare folios, the first folio of Spenser's Faerie Queene, and numerous first editions of Donne, Herrick, and Thackeray. He also owned examples from the Dove, Vale, and Daniel presses, as well as complete runs of volumes issued by the Grolier, Caxton, and Rowfant clubs. 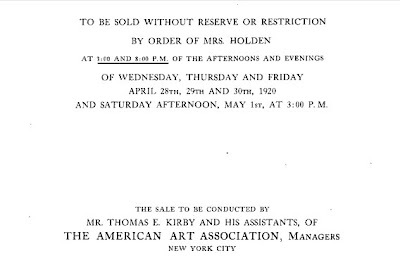 Although the Holden print collection was sold shortly after his death, the major portion of the library did not appear on the auction market until 1920. The sale prices were satisfactory, with Rosenbach, Drake, Hill, and Wells competing for the fine bindings and first editions. 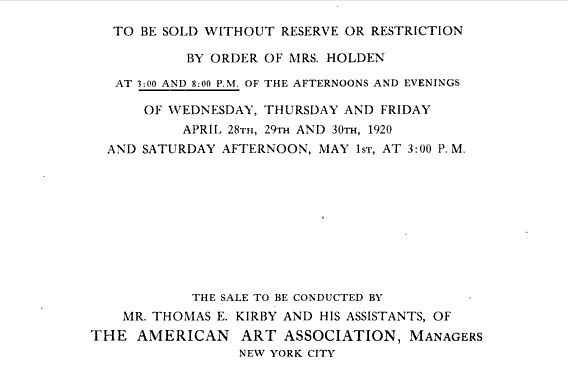 Holden's place in the history of American book collecting is closely associated with the Grolier Club. Through that organization, he promoted high standards in the graphic arts. How did this book get from the auction house in New York City to Augustine Birrell's hands in London? Did Birrell assign A. S. W. Rosenbach, James F. Drake, Walter M. Hill, or Gabriel Wells to acquire the book and mail it to him? 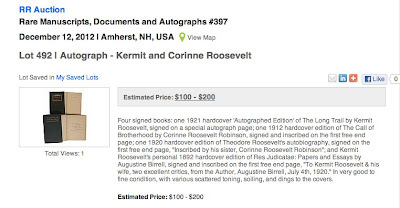 Or did one of the booksellers acquire the book for Kermit Roosevelt, who sent it to Birrell for his inscription? Essays, particularly Birrell's essays, were quite popular near the close of the nineteenth century. And Augustine Birrell wouldn't be the first author who had to buy a copy of one of his own earlier works on the open market in order to give somebody a copy. My money is on Birrell. Kermit Roosevelt (1889-1943) wasn't the first Roosevelt to acquire one of Birrell's books of essays. 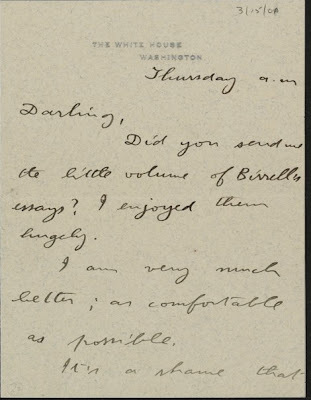 In March 1906, President Theodore Roosevelt's wife, Edith Kermit Carow Roosevelt, sent the President a "little volume of Birrell's essays" which the President said he "enjoyed them hugely." From: Letter from Theodore Roosevelt to Edith Kermit Carow Roosevelt. March 15, 1906 Theodore Roosevelt Collection. Ms Am 1541.1 (0027). Houghton Library, Harvard University. http://www.theodorerooseveltcenter.org/Research/Digital-Library/Record.aspx?libID=o281376. Theodore Roosevelt Digital Library. Dickinson State University. From: Google Books Letters From Theodore Roosevelt to Anna Roosevelt Cowles 1870-1915. From: Kermit Roosevelt and Belle Roosevelt Papers, LOC. 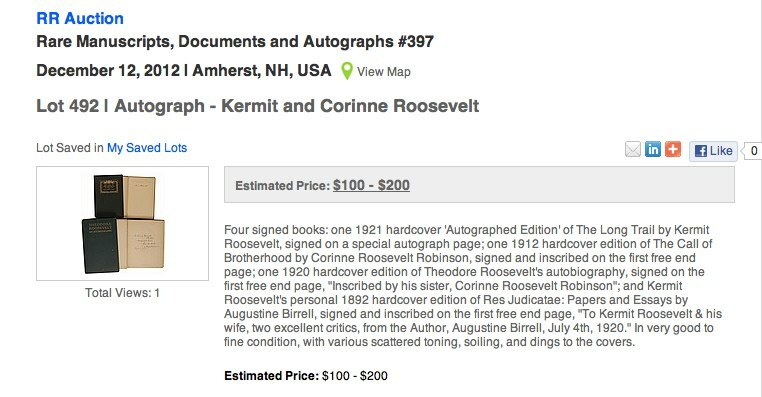 Although Kermit Roosevelt joined the British Army in 1917, I could find no record that he ever met Augustine Birrell. Nor does Birrell mention any of the Roosevelts in his autobiography, Things Past Redress, published posthumously in London in 1937. Kermit Roosevelt served in the British Army during WWII as well, but suffered bouts of alcoholism, depression, and malaria and was discharged. 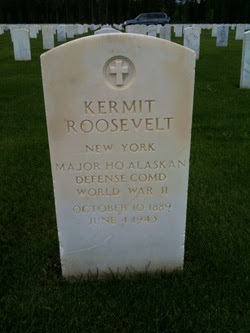 His cousin, FDR, managed to get Kermit a post in Alaska as a U.S. Army intelligence officer. But Alaska became Kermit's final resting place; he committed suicide by gun in 1943. 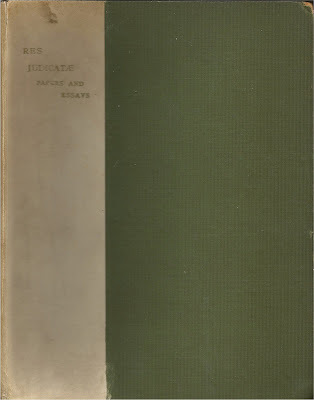 And that, my friends, is the history of my copy of Res Judicatae, the newest addition to My Sentimental Library Collection. Your biblio-sleuthing appears to be great fun, and I admire your fine work in the matter.